The Conservative party’s relationship with the EU has come a long way since Edward Heath urged the UK to be ‘inside Europe’. Euroscepticism has a long history in the party, but the drift of public, media and Tory sentiment away from European unity crystallised in 1988 under Margaret Thatcher. The Brexit process is now bringing these tensions to the fore, writes Oliver Daddow. We can expect more – and even more damaging – spats like the one after the May-Juncker dinner in April. Playing to domestic galleries has always been the default setting for UK politicians when it comes to European policy. In this process, a largely EU-hostile UK press market has played a significant role in both feeding political negativity about the EU and having it reflected back in political discourse. Historically, this has not gone down well with the UK’s European partners. Even notionally pro-European governments have struggled to break the mould. The content of the Brexit negotiations, combined with a febrile election atmosphere, was never going to be conducive to cool, studied diplomacy. The spat that followed the European Council’s publication of its guidelines for the EU negotiations was no exception. The document was immediately overshadowed by a furore over leaks of conversations that took place at a Downing Street dinner held three days earlier. It was attended by Theresa May and members of her Brexit team, along with the President of the European Commission, Jean-Claude Juncker, and his staff. Claim, counter-claim and recrimination were in the air. In an uncharacteristic step, German Chancellor Angela Merkel even weighed in to criticise the UK’s ‘Brexit delusions’. May and members if her government subsequently accused shadowy forces in the EU of meddling in the general election, a claim upon which Eurosceptic elements of the UK media gladly seized. In truth, things were destined to be tough even before May called the snap election for 8 June. The process of UK withdrawal from the EU is, slowly and inexorably, bringing to the fore a fundamental clash of views on the purpose and achievements of the EU that has been simmering away in Conservative Party discourses on the EU for decades. The more this rhetoric surfaces, the greater the chance that we will see totemic spats of this nature during the Brexit process. More seriously, the greater becomes the prospect of the Brexit negotiations descending into farce and the UK crashing out of the EU without a deal. Policy disputes fuelled by acrimony about the past would be a lethal combination, with all parties losing out. ‘European integration has brought peace and prosperity to Europe and allowed for an unprecedented level and scope of cooperation on matters of common interest in a rapidly changing world’. This is a rehearsal of the official story the EU tells itself and others about how European nations have come together since 1945 to replace conflict with diplomacy, by promoting cooperation across all aspects of economic, political and social life in a ‘unique’ experiment in regional governance. European integration in this view is a constant process of exorcising the ghosts of the past: it is a necessity not a choice. It is widely accepted as a narrative about the presence of the past in key countries that have driven forward European integration, notably Germany. Disconcertingly for UK Brexiters, it is an opinion also shared by pro-European Emmanuel Macron, recently elected to be the new President of France. The nearest the Conservative Party ever came to accepting the official version of European history was during the Edward Heath years, 1970-1974, when the UK joined the then European Economic Community (EEC). Heath was a self-confessed Europhile whose maiden speech in the House of Commons in 1950 was on the necessity of Britain joining the European Coal and Steel Community (ECSC). Through his career, Heath consistently put the view that the UK should be ‘inside Europe’ for economic and political reasons – but, crucially, also because he saw the UK as sharing the values of Europe’s ‘founding fathers’. Trade and the economy have always been prominent components of pro-EU arguments in the UK, but in Heath’s time they were accompanied by the articulation of a strong, shared purpose between the UK and Europe that could be advanced and enhanced through greater unity, including UK participation in the political aspects of European integration. There was always discontent with Heath’s brand of pro-Europeanism amongst those in the Parliamentary Conservative Party wedded to Empire, liberal free trade and different forms of nationalism. However, Margaret Thatcher’s speech at the College of Bruges on 20 September 1988 is widely heralded as the turning point in the drift of elite, media and public opinion against the ‘idea of Europe’ in the UK. At Bruges, Thatcher said: ‘Europe is not the creation of the Treaty of Rome. Nor is the European idea the property of any group or institution’. This observation informed her opinion that ‘The European Community is one manifestation of that European identity, but it is not the only one’. By depicting integration as a choice rather than a necessity, Thatcher inverted the Community’s official history of itself. Furthermore, she signalled her desire to overthrow the Heath-driven elite consensus that she felt had taken hold since the UK gained Community membership in 1973. Already a towering figure in UK politics, comparable only to Winston Churchill, Thatcher’s Bruges speech was to have a transformative effect on Conservative Party thought. Overthrown in 1990 at the hands of Conservative Europeanists, the post-Thatcher Conservative Party has spent decades wrestling with her Eurosceptic legacy, even as they tried to keep the UK inside the EU. David Cameron provides a perfect example of the contortions undertaken by post-Thatcher leaders, who feel they have to appease all wings of a divided Conservative Party. Cameron reflected on the EU’s achievements in his 13 January 2013 Bloomberg speech announcing the UK membership referendum. He was, initially, much nearer to Heath’s position than Thatcher’s, faithfully saying that the ‘central story of the European Union’ was that of healing the ‘wounds of our history’. ‘There is not, in my view, a European demos. It is national parliaments which are, and will remain, the true source of real democratic legitimacy and accountability in the EU’. Whereas the EU rehearses post-1945 developments as a reminder of what has been achieved by the EU, Thatcher and Cameron drew upon the history only to dismiss it. As Cameron said, the EU’s aim of securing peace ‘has been achieved’. We should move on from the past to the new challenge of securing prosperity. And so to May, who, it seems, would rather forget her speech favouring Remain on 25 April 2016, now that she is constructing herself as the national leader of Brexit. Whilst ostensibly about the UK staying inside the EU, during that address May introduced some novel arguments to make the case for the UK staying inside the EU. First, echoing Cameron at Bloomberg, May wanted it known that ‘Britain could cope outside the European Union’. Leaving was an option. 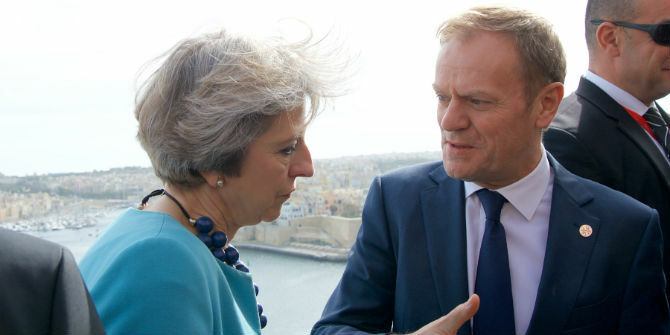 Second, May directly opposed the EU’s official history: ‘Neither is it true that the EU is the only reason the continent has been largely peaceful since the end of the second world war’. This one single sentence symbolises the depth of the fissures the Brexit referendum has opened up between the Conservative Party’s view of European history and the EU’s view of European history. The central conclusion of this article is that Conservative leaders since Heath have never fully bought into the EU’s self-identity as a regional peace-bringer. It has all along been a ‘dialogue of the deaf’. For the guardians of European integration, however, this position represents a heretical misunderstanding of contemporary European history. For Europeanists in and outside the UK, European integration is not a choice but a necessity, a value to be cherished, and a fundamental component of the identity of the nation-states who willingly sign up to it. Written off during the Maastricht ratification process in 1992 by Conservative Prime Minister John Major as ‘rhetoric about growth or slogans about unity’, many in the UK have underestimated the significance of the rhetoric the EU uses about itself. As an EU member, this existential clash of vision and values could remain smothered by pragmatic cooperation on a range of issues. Even as they campaigned to keep the UK inside the EU, however, leaders such as Cameron and May said the UK could go it alone if it needed to. Brexit could, they intimated, prompt the UK to reconnect with the Anglosphere and the wider world, opening up horizons closed off inside a regional bloc. As the terms of the divorce hove into view, things could get very, very messy, if the initial skirmishes are an indication of things to come. Expect history and identity to be running sores throughout the process. The policy disputes will make the headlines, but the background tension will be provided by issues of an existential nature. Note: This article was originally published at LSE Brexit and it gives the views of the author, and not the position of EUROPP – European Politics and Policy, nor of the London School of Economics. Oliver Daddow (@oliver_daddow) is Assistant Professor in British Politics and Security at the University of Nottingham. His research interests include British foreign policy since 1945, discourses of Euroscepticism within the UK, and critical historiography. He is the author of New Labour and the European Union: Blair and Brown’s Logic of History.